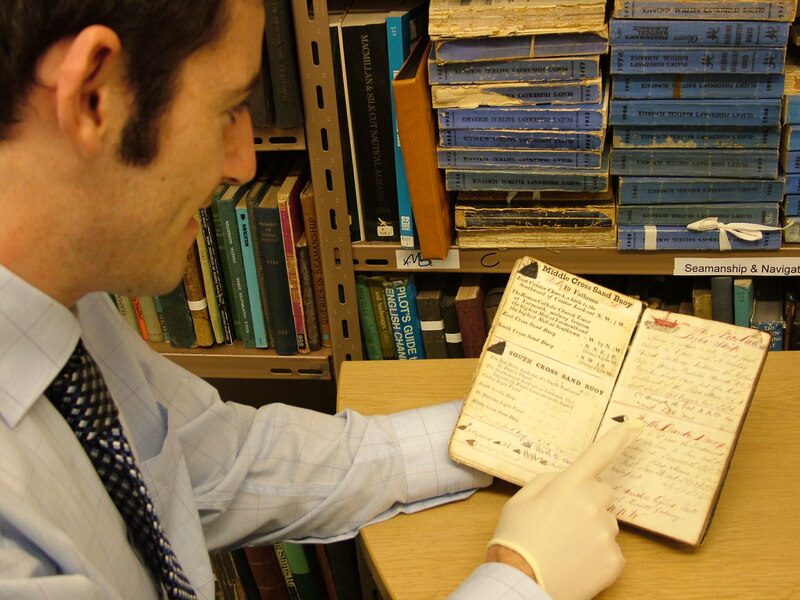 Joe Carr, Curator of Great Yarmouth Museums examining a hand written notebook of Horatio Carter of Great Yarmouth from 1865. The Maritime East Archive at Time and Tide Museum (opened in 2004), Great Yarmouth represents one of the Eastern region's most important maritime archives and includes over 2500 books covering a wealth of subjects from ship building, fishing, marine biology, lifesaving, naval history and yachting. There are over one hundred volumes on Nelson alone. In addition there is a large photographic archive of prints and slides totalling over 20,000 images of regional maritime interest and original documents including ships plans and seamens' charts. The extensive history files contain a wealth of information from original source material covering all areas of the region's unique maritime heritage. Staff have been working hard to get everything in order following the move from the former Maritime Museum where the much of the archive was previously held. Since opening the new museum has accepted significant additions to the archive, including one collection of over 5,000 photographs. The environment of the Maritime East archive has also improved dramatically with greater access and comfort for users. The opening of the archive comes at an exciting time as Great Yarmouth's profile develops further as a centre of Maritime excellence on the East Coast. Further adding to the critical mass of heritage provision within the town.